Tinnitus is described as any sensation of sound in the absence of any external stimulation. It is often described as a ringing, buzzing or pulsing sensation in the ears. Wax is a natural product of the ear canal that serves many important functions, primarily to protect the ear from external dirt and contaminants. However, wax can become a problem if it builds up in the ear canal. Dizziness is a common complaint from many patients, especially those over the age of 70. At Ear & Hearing Clinic we have three audiologists who are certified in Vestibular Assessment & Management and are specially trained in the treatment of BPPV. Central Auditory Processing Disorder affects up to 5% of school-aged children. These students cannot process the information they hear and are usually characterized as “poor listeners”. 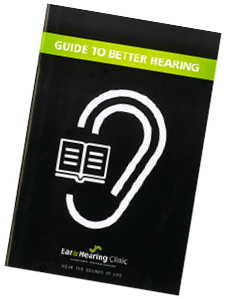 Do you want to learn more about hearing and receive a free book? You can get it either by email or we can send it to your home or office. Are you looking for information classes on hearing loss and hearing aids?